Ideal for laboratories as well as many industrial applications. 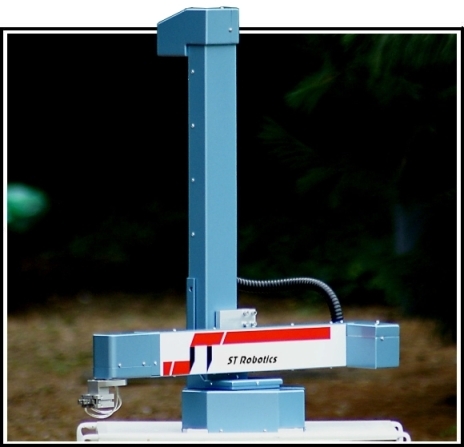 R19 (Perseus) is a low cost entry to bench top robotics, fast, accurate and reliable and easy to program. It is of the cylindrical format with four axes ideally suited to working in a plane around the robot. 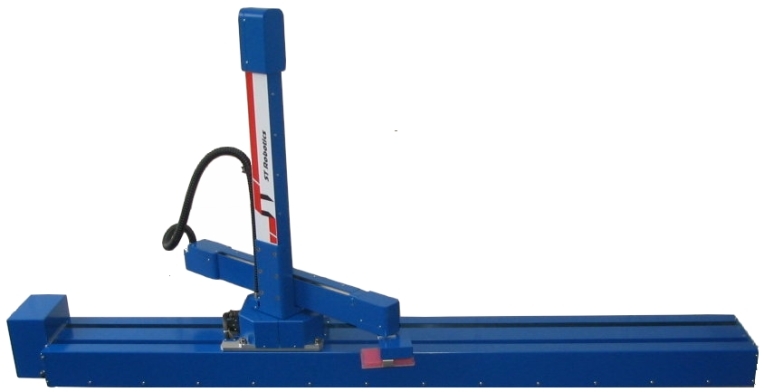 Like our other robot arms it is excellent value fast and accurate. The mechanics are incredibly simple and phenomenally reliable; its predecessors have been running 3 shifts a day for a decade without failure, in fact we give a 2 year warranty. It is easy to apply and program yet is capable of the most intricate tasks. You'll find it a joy to use. Like all ST robots it uses new light weight, high speed, high efficiency stepping motors with encoder feedback. The new design (R19E) has the motors mounted to the sides of the axis drives which reduces the physical lengths of the axes compared to strokes (total movement). This makes it even easier to fit in confined spaces such as fume cupboards or lead enclosures. The package includes the Mk5 controller which is simple and reliable using a partnership of fast CPU and DSP processors and compact micro-stepping drives. Software is ROBOFORTH II which make this robot really easy to get started with yet the most complex motions, interfaces and peripherals may be programmed, assisted by ROBWIN project manager which brings everything together on one screen. ActiveX modules make it easy to integrate into larger systems. Everyone who uses this system agrees it is the most flexible robot software on the planet. With programmable speed and acceleration, programmable gripper confirmation and intelligent error handling the R19 will carry your expensive sample quickly and safely without spilling or dropping or leaving you wresting it from the gripper in some peripheral. note: repeatability is measured as a standard deviation of the worst dimension of the 3, measured at X=0 Y=500mm Z=0 at 50% speed and zero payload over 24 hours after a 1 hour warming up period. Figures for ISO 9283 available on request. representing a liquid handling workstation. R19D places oil sample on PQ analyser, commands analyser, retrieves measurement, passes measurement to computer and returns sample to tray. Designed for and sold as a product by Condition Monitoring Technology. Workspace is a cylinder approx 1100mm in diameter by 500mm high. (see H and V in specifications above and diagrams below). End effector will affect reach i.e. longer fingers will increase reach. Reach is normally measured to the center-line of rotation of the gripper.